MILLIGAN COLLEGE, TN (April 25, 2014) — Milligan College President Dr. Bill Greer announced a new academic structure that reorganizes the college’s nine academic areas into five schools, with the business school becoming the first to be named, thanks to a generous gift from local banker William B. Greene Jr. The plan, which was developed over the past year with faculty input and unanimously endorsed by the college faculty and Board of Trustees, includes the Schools of Bible and Ministry, Arts and Humanities, Sciences and Allied Health, Social Sciences and Education, and Business and Technology. The college’s 100-plus academic majors, minors, concentrations, professional, adult degree completion and graduate programs all fit in one of these schools. The new structure provides a number of advantages, explained Greer, including significant administrative efficiencies. Faculty can be more focused on their respective academic disciplines, while the college still maintains broad-based, shared academic governance. The flexibility and ability to be more nimble and better able to quickly respond to a changing marketplace is also key. Milligan currently is considering new academic programs in engineering, physician assistant, digital media, and has recently added majors in counseling, economics, music business and social work. 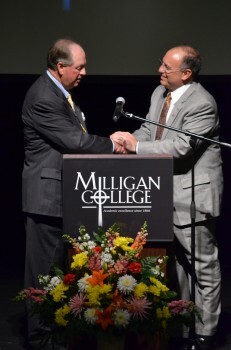 Emmanuel Christian Seminary, which college leaders hope to integrate into Milligan by fall 2015, will be an important part of Milligan’s new School of Bible and Ministry. “This structure actually enhances the position of the liberal arts, while also strengthening our professional programs by grouping them more logically with those liberal arts disciplines that support them most,” said Greer. 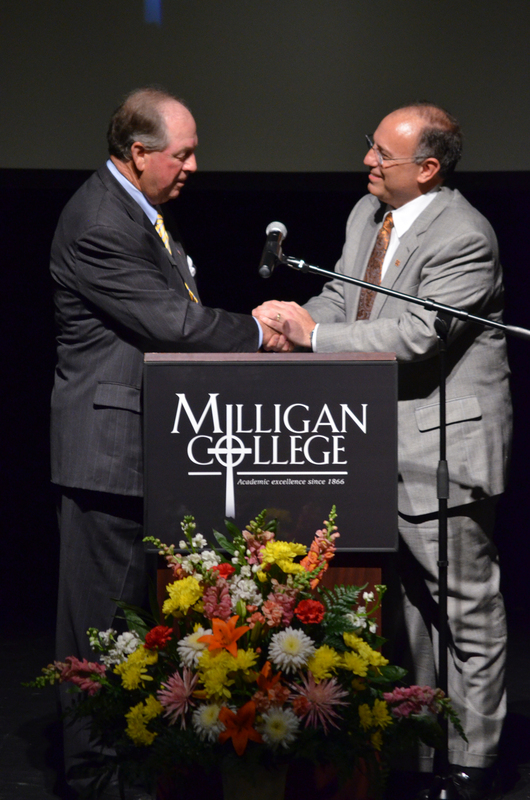 Greer’s second significant announcement was the naming of the William B. Greene, Jr. School of Business and Technology, made possible by the generosity of Dr. William B. Greene Jr., a Milligan trustee and chair of BancTenn Corporation. The School will contain the Area of Business, the Area of Computer Science, and potentially the Area of Engineering. Greene became president and CEO of Carter County Bank in Elizabethton, Tenn., at the age of 24, making him the youngest CEO of a financial institution in the United States. In 1974, he co-founded Bank of Tennessee in Kingsport, Tenn., and is currently chairman of BancTenn Corporation, which holds ownership of Bank of Tennessee, Carter County Bank and Mountain Community Bank. He is a member of the Tennessee Banking Hall of Fame. Implementation of the new academic structure at Milligan will take place over the coming academic year, with full implementation effective by fall 2015. Download Milligan’s new academic organization chart. Posted by tommy on April 25, 2014.